Despite a downpour the previous day, organisers Wharfedale Agricultural Society reported a record attendance and record takings in recent years for the bicentenary show, attended by the Duke of Gloucester. Supreme beef interbreed champion was a 17-month-old home-bred Charolais heifer from father and daughter Colin and Gaynor Mcdowell, of Sunnyside Farm, Billesdon, Leicestershire. The sire is the Mcdowell’s former stock bull Ugie Agent. For good measure, Gaynor and her partner David Cormack also exhibited the reserve champion, a two-year-old Limousin heifer, in calf to Graham’s Unbeatable. The supreme diary championship fell to a local exhibitor, Stephen Coates, of GW and M Coates & Son, of Low Springs Farm, Baildon. The home-bred fourth calver, Bailmoor S-Man Gwen, who was making her debut in the show arena, is by the AI bull Kregnol Mandel S-Man. The supreme sheep championship was awarded to a Charollais shearling ram from Graham Allenby, of Oxpasture Farm, Thornton, Horncastle, Lincolnshire. 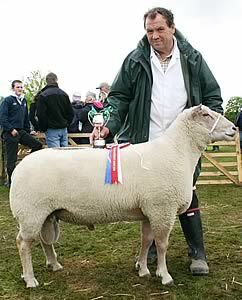 Another show debutant, the March, 2007-born two-shear ram, Southam Hitman, is by the Allenby stock tup, Southam Exotic, acquired for £7,000 and bred in Carmarthenshire, Wales, by Lionel Organ. There were over 3,000 entries for this year’s show, with traditional livestock classes well supported. In total, 75 trophies and £12,500 in prize were available. Show president Mervyn Lister organised a special display covering the 200-year history of Otley Show, along with a moving pageant. A parade of champions was another highlight. Attractions included The Knights of the Damned Jousting Display Team, The Sheep Show, Yorkshire Military Marching Band, Otley Brass Band, Mountgrace Gun Dog Display, Ben Potter Birds of Prey, National Vintage Engine Club, Badsworth and Bramham Moor Hunt, flyfishing and other agricultural and rural life-related demonstrations.